Published: May 1, 2015 at 01:26 a.m. 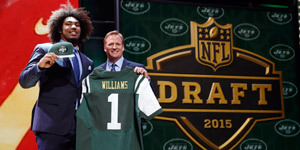 Updated: May 27, 2015 at 03:40 p.m.
Day 1 of the 2015 NFL Draft is in the books -- which means it's time to turn our attention to Day 2. There are still plenty of talented prospects to be had as the second and third rounds of this event -- which, I have to say, was quite a show Thursday, for which both the city of Chicago and the league deserve kudos. Below, you'll find my list of the 10 best remaining prospects, the 10 gems just waiting to be scooped up by teams on Friday. Vitals: 6-foot-2 3/8, 217 pounds, 4.44-second 40-yard dash. There's been some concern about Strong's injured wrist, which might be why he slipped out of the first round, with two other receivers -- Nelson Agholor, who I liked a lot and had ranked as a first-rounder, and speedster Phillip Dorsett -- also rising up to Day 1. The bottom line, though, is that Strong is a big-play guy; he'd be a good fit for the Tennessee Titans, who could stand to add a playmaker on offense. Vitals: 6-5 5/8, 338 pounds, 5.27 40. The big question regarding Smith is whether he plays hard all the time. Still, Smith should be in demand after Thursday's run on offensive linemen (seven were drafted). He's a big-bodied guy with athletic ability and long arms, and I expect he'll go quickly. Tampa Bay would make sense, as the Bucs need an offensive tackle. Vitals: 6-4 7/8, 235 pounds, 4.64 40. 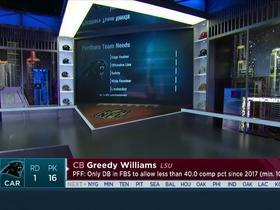 Gregory likely slipped because of off-the-field questions he was facing coming into the draft, but without a doubt, he's the best pass-rusher left. In addition to the aforementioned issues, some were concerned Gregory might not be able to gain enough weight to play the position, but I think if he gets on a good diet, he could put on 10 to 15 pounds and be a pretty good player. Vitals: 6-0, 228 pounds, 4.53 40. Collins ran a lot faster than anyone thought he would, but he also had trouble against some of the bigger receivers he faced, and that's probably why Damarious Randall leapfrogged him into the first round. Collins is just too good a football player -- as anyone who starts for two years at Alabama would have to be -- to let linger for long. Vitals: 6-0 3/8, 196 pounds, 4.42 40. I think we saw in the first round -- when six receivers flew off the board -- that everyone is looking for fast pass-catchers, and Smith should fit the bill for someone on Day 2. He's tall (over 6-foot) and fast (under 4.4 40), and he made a lot of big plays at Ohio State, where he averaged 28 yards per catch in 2014. All you have to do is look at film of Smith in the Buckeyes' 59-0 walloping of Wisconsin -- in which he racked up 137 yards and three touchdowns on four catches -- to see what makes him special. Vitals: 6-3 1/8, 247 pounds, 4.60 40. In my opinion, he's the best slash player -- able to play with his hand on the ground, rush the passer or drop into space -- available, and that's the type of defensive player everybody is chasing. He was very productive at Virginia, piling up 54 tackles, 14.5 tackles for loss, seven sacks and a pick in 2014. Vitals: 6-3 7/8, 336 pounds, 5.27 40. An inside tackle with some pass-rush ability, Goldman has good quickness and athleticism for his position. He's got size and speed, and you've got to love that. Vitals: 6-5 1/4, 329 pounds, 5.17 40. The knock against Phillips is that he doesn't compete hard all the time. But then, he played one of the best games of his career -- in which he notched seven total tackles -- in a blowout loss to Clemson in the Russell Athletic Bowl last year. We're talking about a guy who is taller than 6-5, weighs nearly 330 pounds and ran a 5.1 40 -- guys like that are hard to find. Vitals: 5-11 3/8, 206 pounds, 4.39 40. Coleman, of course, was prevented from working out at the NFL Scouting Combine by a broken foot, but he did post a 4.39 40 at his pro day. He also had an unbelievable 2014 season at Indiana, despite playing for a team that had really no offensive line and not much of a quarterback to speak of. Coleman finished last season with 7.5 yards per carry, and scored a total of 14 touchdowns of 43 yards or longer in his career there. Vitals: 6-4 1/8, 246 pounds, 4.66 40. There's not exactly an abundance of players out there with McKinney's dimensions and speed. We kind of shy away from linebackers because they don't always impact the game as much as players at buzzier positions -- unless, of course, they can play all three downs, as McKinney can. Vitals: 6-4 1/2, 305 pounds, 5.12 40. If not for the off-the-field situation facing Collins this week, he would have been a top-12 pick. This is where you have your investigative team do what it can to find out as much as it can about what happened. 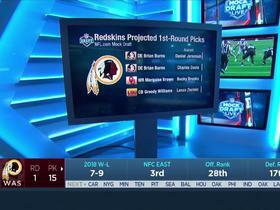 If you're a team with an extra Day 2 pick, one you can approach as sort of a "bonus" pick, Collins is too good a player to leave laying around. He can come in and start at guard or tackle in the NFL.